On Independence Day of 1833, two groups of town ball players from Philadelphia met in Camden, New Jersey.1 One group was a loose collection of friends who had been playing together in Camden for two years. The other, bearing the classical name Olympic, was formed to hold Fourth of July games. The 1833 game was not merely a competition. It also had the character of a corporate courtship leading to merger. The two groups joined to form a new organization, keeping the name Olympic. The Olympic Ball Club of Philadelphia would go on to be by far the longest-lived club of the early baseball era, playing into the late 1880s. It would long keep its association with the holiday, for many years including a picnic, the singing of national songs, and the reading of the Declaration of Independence by the club’s president. The game of 1833 has been called by some the first known match game of baseball. Others have denied it this status. It certainly lacks the satisfying details of other, later candidates for the honor. We don’t know the score, much less have a box score. We can only guess at who the players were. We know the name of one side, but not of the other (nor do we know whether it even had a name). But these are beside the point of the question: Was it a match game of baseball? Or, more precisely, of two questions: Was it a match game, and was it baseball? “Match game” was a technical term in the 19th century. It denoted a formal competition between two defined sides. In its classic form from the heyday of amateur baseball, a match game was between two clubs. More broadly, the two sides might be selected from neighboring villages or might be students from different classes. The distinction was that in a non-match game the two sides were selected ad hoc from a single body: two captains choosing sides from the student body of a school, or from the membership of a single club. In a match game the structure of the two sides existed outside of that one game. This was considered important enough that isolated clubs, with no nearby outside competition, would try to replicate the match-game experience by choosing sides along some arbitrary but objective criterion: fat versus skinny, old versus young, or the especially popular single versus married (usually described as “bachelors versus Benedicts,” showing a Shakespearean flair sadly absent from the modern game). The 1833 game is not quite the classic match game, as only one side seems to have been an organized club. But both sides had an existence outside of that game. This places it well within the range of what could fairly be called a match game. The second question is trickier: Were they playing baseball? They didn’t call it that. They called it “town ball.” Later in the 19th century, town ball would come to be understood as an ancestor of modern baseball. Many modern writers still subscribe to this interpretation, but it has serious problems. For one thing, “base ball” is the much older term, being attested nearly a century before “town ball.” For another, modern baseball derives from a version played in New York City, where town ball is unattested. The actual usage of the time was to apply various regional dialectal terms for a family of closely related informal games. The most important of these were base ball, town ball, and round ball. The modern game is known as baseball because it derived from the New York version, in base ball territory. Had the modern game derived from the Philadelphia version, in town ball territory, it would be called town ball today and base ball would be regarded as a quaint name for its predecessor. The Olympics would switch to the New York game in 1860. New York writers would routinely dismiss the Olympics’ claim to seniority by pointing out that before 1860 they were merely a town ball club, not a proper base ball club at all. This perspective may be reasonable when discussing modern baseball, but is anachronistic for the 1830s. The New York game would have some distinctive features, but the available evidence suggests that these features had not yet developed in 1833. While we know in hindsight that New York was the birthplace of the form of baseball that would displace all others, in the context of 1833 it had no particular claim to special status among the innumerable local variants. So unless we restrict the discussion to modern baseball, this game in Camden is as much baseball as any other of the day. This might be thought unsatisfying, but it really is in concert with other early baseball firsts. These rarely are so clear-cut as is often imagined. Baseball wasn’t really invented in 1839, or 1845, or in any other year one might choose. The Knickerbockers weren’t really the first baseball club. The Cincinnati Red Stockings weren’t really the first professional club. Any claim to identifying the first professional baseball player is at best an educated guess, and at worst pure speculation. However we might like pat answers to trivia questions, history rarely works this way. The reality is usually more nuanced, if not confused and obscure. Is the “first match game of baseball” a poorly documented game played between two obscure groups under vaguely understood rules? This fits right in. 1. 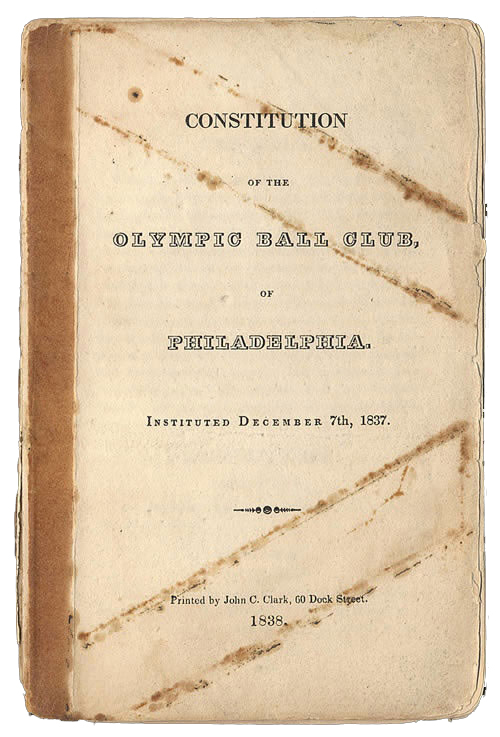 The most important sources for the early history of the Olympics are two pamphlets printed by the club: "Constitution of the Olympic Ball Club of Philadelphia" (Philadelphia: John Clark, 1838), and "Constitution and By-Laws of the Olympic Ball Club of Philadelphia" (Philadelphia: Ashmead, 1866). These pamphlets were typical of clubs of all sorts in that era. The 1838 pamphlet includes the club constitution, by-laws, and membership roster. The 1866 pamphlet added to these the contemporary rules of baseball, and most importantly for our purposes a brief history of the club and historical membership roster from its founding to that day.